Celebrity obsession and the pressure of being 'on brand' in the shift from TV actor to movie star are just two of the issues BoJack Horseman (voiced by Will Arnett) is dealing with as he hits the road for press junkets and begins his Oscar campaign for the biopic of Secretariat (a film that comes with the tag line of 'he’s tired of running in circles'). The attention to detail and background visual jokes are absolutely on point once again with this series proving to be an insightful exploration of the troubles of co-dependent relationships. Princess Caroline’s (Amy Sedaris) new business venture of running her own celebrity agency is riddled with problems. She’s short on cash, has no life outside of work and has employed the inexperienced Diane Nguyen (Alison Brie) to run her social media. Meanwhile Diane falls deeper into the marketing machine, with her morals being tested while also trying to solve her relationships woes with Mr Peanutbutter (Paul F Tompkins). Creator Raphael Bob-Waksberg takes a perceptive glance at how the role of the critic has changed over the last few years throughout the course of the show. One episode takes the viewer back to 2007 when Twitter was taking off and popular culture was all about Lost, the final episode of Sopranos and David Hasselhoff’s drunk floor burger eating. Bob-Waksberg picks apart the impact of social media and how tweeting can encourage awful pack mentality but also bring about positive change. We also learn the origins of the main characters relationships with some interesting and refreshing revelations about Todd. Middle-aged ennui hits all the characters hard as they look back on what they have and have not achieved over the last nine years. The third series maintains its angry scepticism at the stupidity of certain hypocritical politics (an episode about abortion is particularly relevant) and the absurd nature of the Hollywood industry with witty digs at the Oscar nomination process. Somehow it even manages to get darker than the previous series by ending on a poignant and moving note. But there’s also beauty and frolics amongst the sadness with an almost silent episode set underwater at a film festival paying homage to Rene Laloux’s surreal Fantastic Planet. 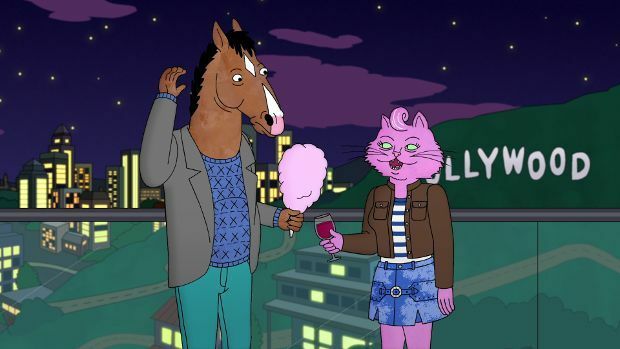 Season 3 of BoJack Horseman is available on Netflix from Fri 22 Jul.